10th Period: Do Charters Spend More than Districts, Or What Do Medians Mean? 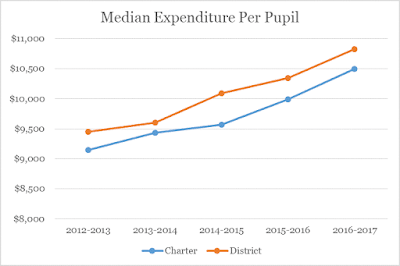 Do Charters Spend More than Districts, Or What Do Medians Mean? I try to steer clear of mumbo jumbo on this blog. I wish to simplify rather than complicate already dense, complicated topics. 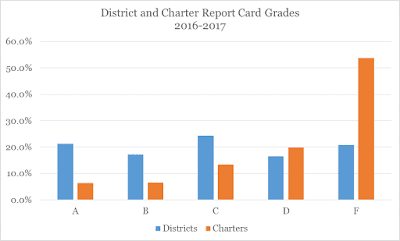 But when it comes to expenditures in charter schools and school districts, it matters whether you know what medians and means are. So please indulge a little nerdification here. For those who need a refresher, means are averages. Medians are midpoints among a range of numbers. So, for example, the median of 1,2,3,4,5 is 3. The average of 1,2,3,4,5 is also 3. However, when there is a lot of variation in the numbers, averages (or means) can be thrown off. Sometimes to a great degree. So, for example, the mean of 1, 2, 3, 4, 3,000,000 is 600,000. The median remains 3, which is a much more accurate way to describe a typical number in the series. So when you have a series of numbers with wide variations, you generally want to use medians because they answer the question of what is the "typical" number. If you don't have much variation between numbers, generally averages work better. Which brings me to the question of which schools spend more in Ohio, charter schools or school districts. These two charts will tell you both, depending on whether you want to use medians or means. The graphic on the left shows the median expenditure per pupil for each school type. You'll see that generally, Ohio school districts spend a few hundred dollars more per pupil than charter schools. The chart below the median chart shows that on average, charter schools spend more per pupil than Ohio school districts. So, what gives and which numbers matter most in determining this issue? Well, as you can see, the average per pupil expenditure varies wildly in charter schools, likely due to the much greater variation in their financial reporting competence than anything else. For example, in the 2013-2014 school year, the largest per pupil expenditure in charter schools was more than $1 million, which probably wasn't accurate. The largest per pupil expenditure in a school district that year was a little more than $20,000 (a tiny Lake Erie island district was over $30,000). So the variation among school districts was much smaller than the variation in charters that year. And pretty much every year since. Except for this past school year of 2016-2017. 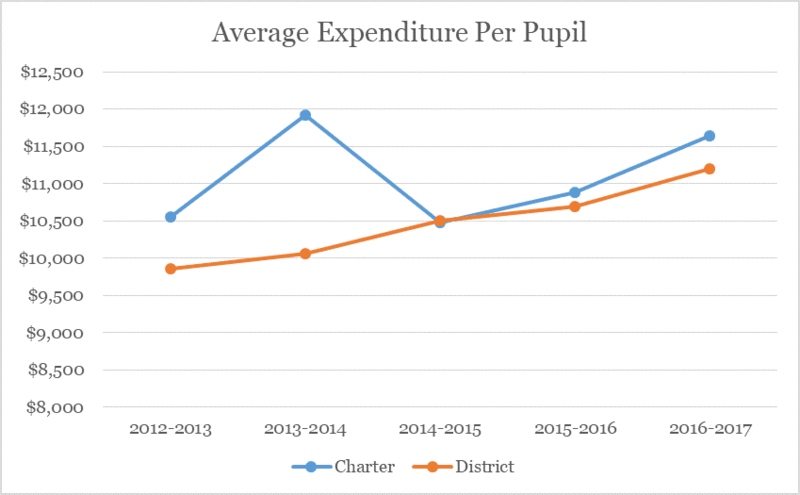 The variation between the highest and lowest spending charter school last year was $36,000 -- not far off from the school district variance of $24,000. In the 2013-2014 school year, the reported variation in per pupil spending at charter schools was $1.4 million. 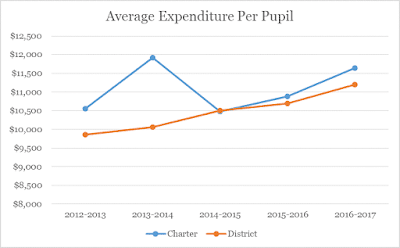 And even if you discount the handful of charters who likely erroneously reported spending more than $100,000 per pupil, the difference remained well north of $85,000. So that means in order to be fair, you had to use medians to express what a "typical" charter or district spent to account for those variations. Which means charters spent less per pupil than districts. This year, though, there's a real question if using averages now is fair game. Because the wild variations in charters aren't there anymore. 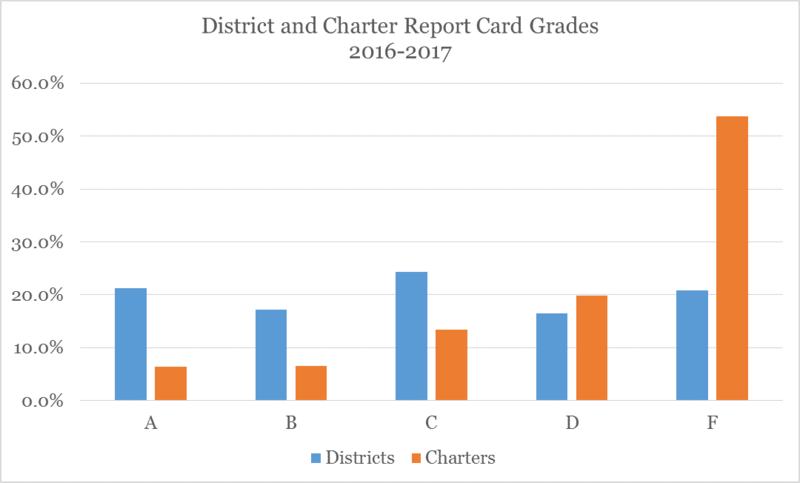 In other words, the "typical" and "average" charter school are becoming far more similar than in the past. Why does all this matter? Because we were told (and have been told) again and again that charter schools and the private sector that drives them perform the same or better academically at lower cost than Ohio's local public schools. And charter school advocates are now saying they need more money because they can't spend what they need to spend in the classroom. Yet Ohio's charter school sector overall spends about the same and performs far worse. Even if you want to look at medians, is the few hundred dollars' savings worth the far worse graduation rates and worse overall academic performance in charter schools? Again, this is not saying we should eliminate all charter schools. But we should take a hint from the earlier discussion of means and medians. If there are so many poor performing charter schools and a relative few high performers to skew overall performance and cost, shouldn't we eliminate the poor performers so the high performers can thrive? The ECOT closure is a good start toward making Ohio's charter school sector more reflective of the ideal market-based education model that's focused on quality rather than enrollment, real or imagined. Yet we still fall short of our kids and families who want options but are instead duped into believing a few slick brochures and smooth talking sales pitches selling them on the idea that choice rather than quality should drive their children's education. It is the quality of the option that should drive the choice. And it is up to policymakers to ensure that quality is what drives their desire for more educational options. Because that whole "better and cheaper" argument for charters? In Ohio, that dog don't hunt. This post is great in its comparisons and contrasts of the medians and means of charter and public schools! It's always great to differentiate between the two and use them both to get a clearer picture of the statistics. To my understanding, the original intent of charter schools was to take underperforming students from the public system and give them smaller environments to improve success. However, this intention has obviously been obscured. In California, charter schools are often subjected to the lottery system because of the competitive nature; is this the same reality in Ohio? Is there a tendency to send higher achieving students to charters, or is there another situation going on? A site of the tenth period is waiting for you here in this great field. You can also find your time with this are and can maintain your life with the best deal. Get the link of http://www.mbaessaywriting.org/our-services/mba-application-essay-service/ from this field and see more districts. Medians so not show the right results as always so we need to have the means of the values and make our analysis so https://www.accountingassignmenthelp.net/the-most-colmmon-accounting-problems-and-solutions/ can be used as a help from the authorities to make a work a success. They are doing according to the time and when the time is right they spend more on http://www.graduateadmission.org/undergraduate-application-for-haas-and-other-famous-schools/ as well to make it more prominent in the eyes of our students. These statistical figures shows that how important is to get these acadamies useful. We should must go to http://www.letterofrecommendation.biz/ to check about the latest updates. Best blog for statistics students. Here, they will get knowledge about the mean, mode and median. Your diagram and table are showing great knowledge to us. Just visit here http://www.statementofpurposemba.net/perfect-mba-sop-for-ms-in-business-analytics/ for all service. ECOT: Now it's criminal. Literally.